It was perhaps an early indicator of his personality that Pizarro turned on Balboa in 1519, a situation that left Balboa dead and Pizarro the new mayor of Panama City. Fueled by tales of El Dorado, Pizarro mounted three expeditions into the Inca lands to the south in the following years. In 1532, he began his Spanish-backed official mission to conquer Peru and claim it as New Castile. Unsurprisingly, the Inca were disinclined to hand over their lands to the Spanish interlopers. Highly outnumbered and far from reinforcements in Panama, Pizarro resorted to subterfuge to gain the upper hand. He invited the Inca emperor Atahualpa and his army of 80,000 to a meeting in Cajamarca. Since the central square was much too small to host such a large group, only a small entourage accompanied Atahualpa to the square, unarmed as a sign of good faith. That good faith was famously misplaced, and Pizarro’s men surrounded and killed most of the entourage and took Atahualpa captive. After convincing the emperor to fill a room full of gold and treasures from his Empire as ransom, Pizarro had him garroted. 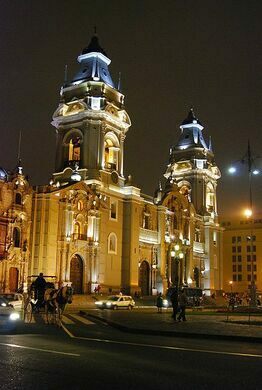 In the years after his conquest, Pizarro lived high on the hog on his riches and fame in the new town of Lima, which he helped establish. During this time, Pizarro and his brothers began fighting with one of their men over shares of the booty. Eventually the Pizarros had the man killed (garroted, again) and his son stripped of any fortune. Three years later, his supporters had their revenge, attacking the Pizarro household at dinnertime. Pizarro fought back, killing two men and attacking a third, but when his sword became stuck in one man’s chest, he could not defend himself from deadly blows to his neck and head. 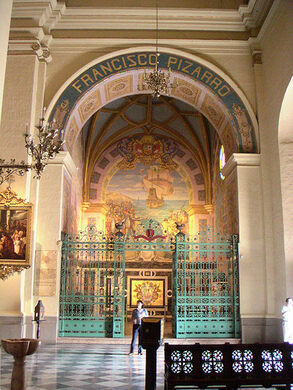 Pizarro’s body was moved several times over the following years, from the plaza behind the cathedral to a spot under the altar. In 1891, the body was disinterred and placed in an elaborate glass-sided coffin to celebrate the 350th anniversary of his death. It was not until 1977 that several other forgotten coffins were discovered in an old crypt. 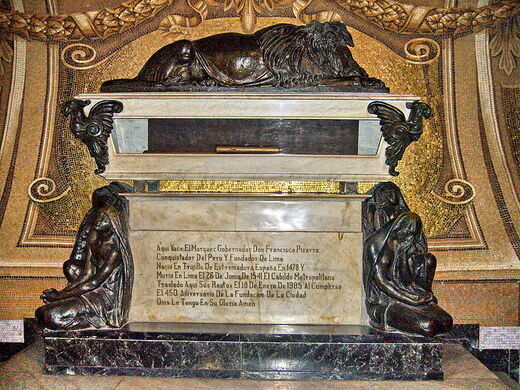 One of the boxes, once cleaned, bore a troubling inscription, identifying the contents as the skull of the conquistador. With the help of forensic anthropologists and historians, it quickly became clear that these were in fact the correct remains, identified primarily by the numerous sword blows to the head. This new body was moved into the glass coffin, and the unknown squatter removed to a less glamorous place of final repose. Since Pizarro’s actual body is not a crowd-friendly mummy but a pile of disarticulated bones, visitors now see a small coffin inside the glass sarcophagus. Lima’s Museum of Anthropology is lined with thousands of elongated human craniums.